A landscape image isn’t just a click, it’s a process that starts with an idea, a plan for the best way to organize and emphasize the scene’s significant elements, then improves with each subsequent click until the photographer is satisfied. The first click is like a writer’s draft, and subsequent clicks are the revisions. After each click, a photographer should stand back and evaluate the image on the LCD (I love the large LCDs on today’s DSLRs), refine (exposure, composition, depth of field, focus point), then click again. Repeat as necessary. This approach is particularly valuable in macro and close-focus images, intimate scenes where even the slightest adjustment in composition, depth of field, and focus point can dramatically alter the result. It’s a prime reason I’m such a strong tripod advocate (evangelist)—when I’m done evaluating, the shot I just evaluated is sitting right there on my tripod, waiting for me to apply the adjustments I deem necessary. When photographing fall color, I look for a leaf, or group of leaves, to isolate from the rest of the scene. 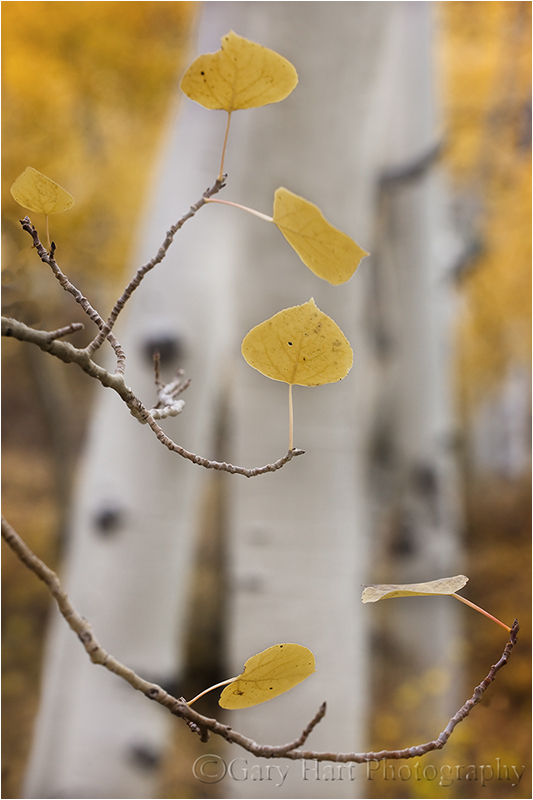 In the above image, captured in an aspen stand just down the hill from North Lake, west of Bishop, I started with this collection of four vertically stacked leaves, positioning myself so leaves were suspended in front of a receding line of bleached aspen (they’d have been lost against the background foliage). I wanted the background soft but recognizable. Using my 70-200 lens with a 25 mm extension tube, and a neutral polarizer to help the color come through the leaves’ waxy sheen, I settled on the general framing fairly quickly—vertical orientation, fairly tightly composed. Exposure was pretty straightforward in the soft overcast, though an intermittent breeze meant I had some decisions to make. Since the breeze ranged from light to completely still, I used ISO 400 to enable a faster shutter speed, and timed my click for the brief pauses. Though I don’t always catch balance, relationship, and border problems through the viewfinder, after two or three click/evaluate/refine cycles, I had the composition nailed. But I was far from finished—in fact, I’d just started. I don’t trust critical DOF decisions made through my viewfinder or even on my LCD, so when a composition I like a lot makes significant use of DOF and focus point, I always take a series of frames, bracketing DOF (f-stop) around the DOF I think is best. Sometimes I’ll range all the way from f2.8 to f22. In this case I tried frames ranging from f4 (my 70-200’s fastest aperture) to f16 (at f16 I increased my ISO to 800), in (more or less) one-stop increments. Since I thought f8 would give me about the right combination of sharp foreground and soft background, I even took a couple of extra frames in 1/3 stop increments around f8. Back home on my large monitor I scrutinized each frame closely and ended up choosing this one at f7.1. In Lightroom I warmed the image slightly to remove a blue cast on the white trunks. Because I intentionally underexposed the scene at capture (to ensure that I didn’t clip any of the red channel, where most of the yellow is), in Photoshop I dodged the trunks to remove the dinginess introduced by my underexposure. Otherwise my processing was pretty much standard stuff—a subtle wiggle in Curves to add contrast, Topaz noise reduction, and selective sharpening of everything in focus with Unsharp Mask. I love the details that you give in all of your posts, Gary. That’s like gold to me! This sounds eerily familiar! I believe you told me this before my inadvertent stumble at the Bristlecones. Yeah, Gene, as I was telling you that it was all quite fresh in my mind as I’d just written this that morning. Glad you made it home okay. How was the ‘shoot’ Wednesday night and Thursday morning? I got home in time to watch the A’s last 3 innings in their win to win the West title from Texas. Sunset at Mono Lake was nice but not spectacular, but we went back out after dinner and had a real nice night shoot. Sunrise this morning was spectacular. Tonight we’re off to Tuolumne Meadows and Olmsted Point in Yosemite–fingers crossed. I think everyone’s starting to feel the pace, but no mutiny so far (but I guess I’d be the last to know). Thank for such a detail explanation of your process. I think sometimes I’m a little lazy and then get frustrated when the shot doesn’t work out. You’ve inspired me! I am headed up to shoot some Fall color next week, and I am wondering how to handle my exposures to get the most out of my images- I always shoot in Raw, and usually shoot to the right…I am using an older camera (Canon40D) which has lots of noise if I underexpose at all. I do try to keep the RGB histograms under control-I know there are always trade-offs when shooting. What do you think is most important? Shooting to the right overall, or making sure I don’t blow any of the color channels even if I have to underexpose some? I am now inspired to stay longer and really work a scene before I move on! Thanks for that.